A: Chinese President Xi Jinping met with Indian Prime Minister Narendra Modi, who came to China to attend the 9th BRICS Summit and the Dialogue of Emerging Market and Developing Countries in Xiamen on September 5. During the meeting, President Xi stressed that China and India are each other's important neighbour and we are the two largest developing countries and emerging markets. A sound and stable China-India relationship serves the fundamental interests of the two peoples and is the shared aspiration of this region and the international community at large. Over recent years, the leaders of the two countries have reached broad consensus on developing China-India relations, agreed to build closer development partnership and identified the long-term goal for the development of China-India relations. Under the guidance of the Five Principles of Peaceful Coexistence, China stands ready to work with India to enhance mutual political trust , promote mutually beneficial cooperation and move forward China-India relations in a right track. President Xi pointed out that, China and India should stay committed to the basic judgment that two sides present development opportunities and pose no threat to each other. We hope the Indian side can look at China's development in a correct and rational light. We shall show the world that peaceful coexistence and win-win cooperation are the only right choice for China and India. The two sides should respect each other, seek common ground while shelving differences and uphold peace and tranquility in our border areas. China and India have great potential for cooperation in socio-economic development. The two sides need to strengthen the synergy of development strategy, expand cooperation in infrastructure construction and connectivity, enhance people-to-people and cultural communication, reinforce communication and coordination in international affairs and make the international order more just and equitable. China is willing to work with BRICS countries to ensure sound implementation of the outcomes of the BRICS Xiamen Summit and jointly open up a new dimension for BRICS cooperation. These are what I know about this meeting. Follow-up: Was the recent border stand-off in Dong Lang discussed in the meeting? A: Just as I said, President Xi pointed out in this meeting that the two sides should respect each other, seek common ground while shelving differences and uphold peace and tranquility in our border areas. According to my information, Prime Minister Modi also agreed that the two sides should work together to safeguard peace and tranquility in our border areas. Q: There has been interest on a series of initiatives put forward by China during the BRICS Summit, including the Economic and Technical Cooperation Plan for BRICS Countries with 500 million yuan for the first term and the four million US dollars to the New Development Bank Project Preparation Facility. Some think China is trying to strengthen its leadership in BRICS cooperation and forge the BRICS cooperation mechanism into a platform to exert global influence, so that it can change the Western-dominant international order. How do you comment on that? A: In terms of cooperation, BRICS countries have always been committed to mutual respect and seeking common ground while shelving differences. Decisions are made through consultation among us all and there's no such question as who should dominate. BRICS cooperation upholds the common interests of us all and embodies our common will. The initiatives and proposals put up by the Chinese side, including the relevant proposals in the BRICS Summit in Xiamen, are aimed to promote cooperation among BRICS countries and the solidarity and development among emerging market economies and developing countries. Since the very beginning, BRICS cooperation has been guided by the principle of dialogue without confrontation, partnership without alliance. The cooperation among BRICS countries have maintained openness, transparency while pursuing mutual benefit and win-win results. It neither targets at a third party nor confronts anyone. We advocate following the purposes and principles of the UN Charter, international law and basic norms governing international relations in conducting state-to-state relations and are committed to promoting open, inclusive and balanced globalization and making joint contribution to the building of the community of shared future for mankind. As representative emerging markets and developing countries, BRICS countries share common interests and aspiration in promoting better and stronger global economic governance. Over these years, the five countries have spoken with strong voice in this regard and pushed for a series of outcomes in global governance reform. These measures and progresses conform to the interests of developing countries as a whole and embody the development trend of the times, and will help uphold world peace and stability and promote the sustained and steady growth of world economy. Q: Human Rights Watch released a report to criticize China today. What is your response? A: The Chinese government attaches great importance to promoting and protecting human rights. We have always actively participated in the work of the UN human rights agencies, constructively promoted the UN human rights institution in handling various human rights issues fairly and objectively, advanced different kinds of human rights, and advocated dialogue and cooperation in the field of human rights on the basis of equality and mutual respect. All bear witness to our contributions to the sound development of the international human rights cause. We urge the relevant organization to remove the tinted glasses, perceive China's human rights development and contributions to the international human rights progress in an unbiased manner, and stop groundless criticism on China. Q: President of the Swiss Confederation Doris Leuthard said on September 4 that sanctions did not change many things in terms of convincing the DPRK to abandon its weapons programs, and it is really time now to sit down at a table. Switzerland offered to act as a mediator to help resolve the Korea Peninsula nuclear crisis, for example, to host talks between foreign ministers of the relevant countries. What's China's comment on that? A: We have noted the relevant remarks of the Swiss side. 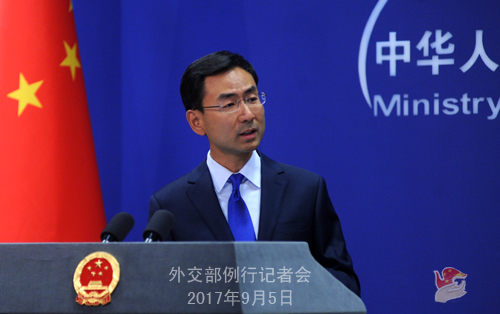 China always welcomes and encourages approaches and proposals that are conducive to easing the tensions on the Korean Peninsula, enhancing mutual trust and promoting early resumption of dialogue and settlement of the Korean Peninsula nuclear issue. We also welcome the positive and constructive role of the relevant party in easing the situation and promoting settlement of the Korean Peninsula nuclear issue. We have also noted that at present, the call for peaceful settlement of the Korean Peninsula nuclear issue through dialogue and negotiation among the international community is the mainstream. We hope the relevant parties can take heed of the rational call from the international community and stay cool-minded rather than provoke each other and pour fuel on the fire. To conclude, I shall stress that in terms of resolving the Korean Peninsula nuclear issue, the use of military means is not a viable choice and sanctions alone will never be a way out. Q: According to reports, ROK Foreign Minister Kang Kyung-wha had a telephone conversation with Foreign Minister Wang Yi yesterday. Is China open to additional sanctions on the DPRK? Can you give us more details of this telephone conversation? A: On September 4, Foreign Minister Wang Yi and ROK Foreign Minister Kang Kyung-wha had a telephone conversation. 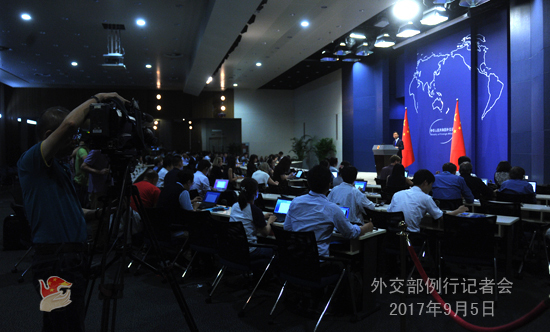 During that, Foreign Minister Wang Yi stated China's stance on the current situation on the Korean Peninsula. On your question of whether China will support new sanctions by the UN Security Council, I answered this question yesterday. As to how the UN Security Council will respond and what action it may take, this depends on what comes out of the discussion by its members. 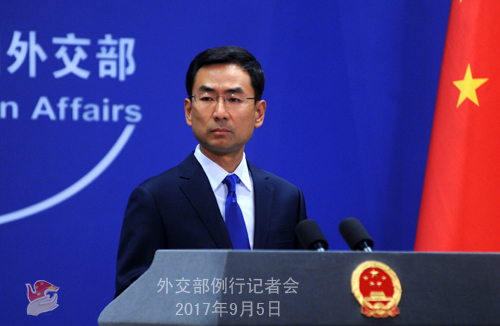 China will participate in the relevant discussion of the Security Council with a responsible and constructive attitude while following our stance of advancing the denuclearization of the Korean Peninsula, upholding peace and stability on the Korean Peninsula and promoting the peaceful settlement of the relevant issue through dialogue and negotiation. Q: The White House said that in principle, it has approved scraping a warhead weight limit of the ROK, allowing missiles of greater significance to be developed. What is your response? A: I have seen the relevant reports. I would like to say that the current situation on the Korean Peninsula remains highly complex and sensitive and we hope the relevant parties can make efforts to prevent the escalation of the situation.